A new progressive alliance could break the stalemate—but whoever wins will face a hamstrung economy and deep discontent with politicians. The June elections—in effect a second round—may well break the stalemate. While the polls do not indicate major shifts in voting patterns, a new electoral alliance between Podemos, the United Left, and other parties, which was confirmed on May 9, is likely to leverage the electoral system to its advantage, increasing the parties’ combined seat count by 25 percent. 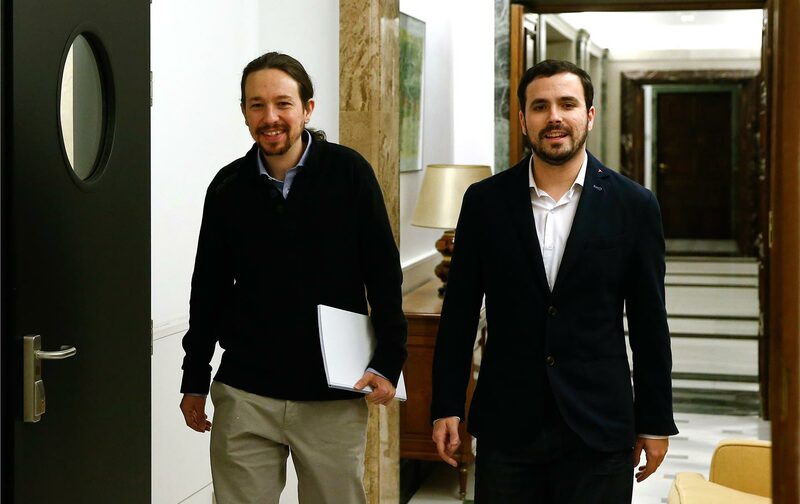 This alliance, Unidos Podemos (“United We Can”), would potentially pave the way for a broad, progressive majority coalition of Podemos, the United Left, and the Socialist Party (PSOE). Like Portugal’s, this left-of-center governing coalition would be poised to resist austerity and change the balance of power in the European Union. IU, which includes Spain’s Communist Party, has been remade under its charismatic young leader, Alberto Garzón. He has successfully weathered internal crises, including corruption scandals and the departure of major party figures. More important, he has led a process of democratic renewal of Spain’s old left, pushing for the alliance with Podemos despite the resistance of his party’s old guard and disagreements with Podemos over issues such as NATO (which IU wants to leave) and the monarchy (IU is staunchly republican). In what many see as a symbolically generous gesture, Garzón agreed to be fifth on the coalition’s list instead of third, a position reserved for Íñigo Errejón of Podemos. (Ensuring proportional representation, the list will alternate between men and women.) This kind of goodwill is rather less present in the PSOE, however. In fact, judging by the events of the past four months, it’s anything but certain that the PSOE won’t instead help the conservative Popular Party (PP) stay in power. Almost eight years after the mortgage crisis that led to the Great Recession, Spain’s economic situation continues to be among Europe’s worst. Although the economy has registered a modest 3 percent growth, inequality has soared while jobs continue to be scarce and increasingly precarious. Official unemployment numbers clock in at 21 percent overall and at 45.5 percent among youth. One-day contracts have grown 25 percent over the past year. From January to March of this year, roughly 429,000 one-day contracts were signed in Spain, more than twice as many as during the same time in 2007, at the beginning of the Spanish crisis. And Spain’s precarious employment has hit women the hardest: 18.5 percent of women who work a daily eight-hour shift earn less than 1,000 euros per month, compared to 9 percent of men. UNICEF reports that a third of Spain’s children are at risk of poverty or social exclusion. “Extreme insecurity and lack of opportunities have trapped an entire generation of children and young adults,” UNICEF wrote. Economic emigration has tripled since 2008, and hundreds of thousands of young Spaniards, many with advanced degrees, have moved to the UK, Germany, France, and Latin America. “Your party, Mr. Sánchez, is handing naturalization papers to fraud and facilitating precarity,” Pablo Iglesias, the leader of Podemos, said in a speech in Spain’s lower house of Parliament in early March. “If you continue down this path, yielding to orange pressure, don’t be shocked when any day now workers will demand that you hand over the S and the O in your acronym.” Iglesias delivered that volley to Pedro Sánchez, the PSOE leader, in a heated debate over the latter’s potential investiture as the country’s new prime minister. The ‘S’ and the ‘O’ in PSOE stand for Socialist and Worker. And “orange pressure” refers to the party color of Ciudadanos, the new alternative conservative party. Others saw the match as a perfect fit that only confirmed the Socialist Party’s steady drift toward the right. In its response to the Great Recession, the Spanish government, then led by PSOE, accepted austerity measures and the privatization of public services, going as far as pushing through a constitutional amendment that solidified a commitment to pay down the national debt as a priority over social spending. Ciudadanos, for its part, is a media darling in Spain, largely thanks to its comprehensive neoliberal agenda to decentralize the country’s economy. One satirical caption on Twitter by Gerardo Tecé—picture a young Spanish Andy Borowitz—to a photo of Sánchez and Rivera signing the coalition agreement read: “On the one that says 90+40, what’d you put down, Pedro?” asks Rivera. “176,” answers Sánchez. “Oh, me too.” Adding to the campiness of the affair was the fact that the two had chosen a room replete with the symbolism of the Spanish transition to democracy following Franco’s death, including Juan Genovés’s iconic painting El abrazo (“The Hug”). Sánchez touted the centrist agreement as the “change” Spain’s voters had called for. “If you vote ‘no’ to my investiture, Mr. Iglesias, you will be voting no to…the recovery of universal healthcare…to the climate change law, to the repeal of solar energy taxes,” he rebutted in Parliament, following Iglesias’s speech. “Now, go tell that to your partners in Equo,” he said, referring to the Spanish green party that has joined in regional coalitions with Podemos across the country. Podemos, unswayed, voted against Sánchez. The vote, which landed Sánchez a 131 to 219 defeat, confirmed the stalemate that has left Spain without a government since December. The media have been quick to brand the repeat elections as a symptom of dysfunction. “Spain’s squabbling politicians” have failed to “to rise above personal ambitions and rivalries” and irresponsibly left their country in “confusion,” The New York Times editorialized on April 27, drawing on the age-old stereotype that paints Spaniards as a noble people chronically plagued with incompetent governments. But matching the Times’s patronizing tone was its equally misleading view of the current deadlock. Instead of seeing deep social and economic divides, the editorial harkened back to mid-century ideals of statesmanship in order to moralize en masse about a lack of political leadership. With the passing of each year, the ruling Partido Popular has sunk deeper and deeper into the quicksand of corruption. Helmed by Prime Minister Mariano Rajoy, the Partido Popular (PP), Spain’s staunchly traditional conservative party, is in charge until a new government is formed. With the passing of each year, it has sunk deeper and deeper into the quicksand of corruption. An endless stream of scandals since 2009 has not let up, thanks in part to an emboldened judiciary and a growing independent media. The latest revelations occurred just weeks ago, in April, when the Panama Papers managed to achieve the impossible: the resignation of José Manuel Soria, Spain’s minister of industry, energy, and tourism and a candidate to replace Rajoy as the head of the party. Healthcare has been an important dividing line. Podemos and United Left have advocated a return to universal coverage, abrogating the system of co-payments as well as stamping out a ballooning private healthcare industry. Their right-wing counterparts, the PP and Ciudadanos, have pushed for strengthening a private system that, for many unemployed and temporarily employed Spaniards, remains economically out of reach. The Socialist Party, meanwhile, has hedged its bets. On decisions ranging from advocating for a return to universal healthcare that includes public-private partnerships to allying with Ciudadanos, Socialists have been performing something of a high-wire balancing act, seasoning middling progressivism with conservative economics. For decades, the PSOE alternated in government with the PP in what was basically a two-party system. The past two years, however, have witnessed the party’s inability to deal with Podemos, its first real threat from its left since the transition to democracy. The wariness toward Podemos points to Socialist anxieties over the nightmarish fate of its Greek counterpart, the PASOK, which, after implementing austerity measures and joining in a grand coalition, found itself decimated by Syriza. “Pedro Sánchez has been the politician that’s made the most moves” this spring, says Galaup, the journalist. It’s a strategy that’s clearly meant to amass goodwill from voters, who see that he’s trying to get things done. And it also sharply contrasts with the modus operandi of his principal antagonist, Mariano Rajoy, who didn’t attempt a vote of investiture when he was first given the opportunity, immediately following last December’s elections. What really scared Socialist elites was not the “breakup of Spain”; it was Podemos’s threat to their hegemony on the left. But most Spaniards have trained their eyes instead on the Socialists’ strategy toward Podemos. Sánchez’s botched push toward investiture has many wondering whether the Socialists would reconsider their negotiating stance following the upcoming June elections. “What would you have done or what wouldn’t you have done?” Cristina Pardo, a journalist for La Sexta, recently asked Susana Díaz, the president of Andalusia and a powerful voice in the Socialist Party against any coalition with Podemos. “What the PSOE always does,” Díaz said, brushing Pardo off: “put Spain’s interests above those of the party.” Pardo audibly scoffed. With Podemos’s 69 delegates and the support of smaller Catalan and Basque parties, it might have been possible for the Socialist Party to cobble together a small but workable progressive majority. Yet the Socialists never really appeared to consider that option. Sánchez, Díaz, and other Socialists publicly blamed the difficulty of a progressive coalition on Podemos’s willingness to resolve a longstanding constitutional stalemate by allowing Catalans a referendum on independence. But what really scared Socialist elites was not what they demagogically branded as the “breakup of Spain”; it was Podemos’s threat to the PSOE’s hegemony on the Spanish left. “The PSOE was willing to govern with support from Podemos but not to enter into a coalition or include Podemos members on ministerial posts,” says Ignacio Sánchez-Cuenca, a professor of political science at the Carlos III University of Madrid. “This was not a matter of leaders’ personalities but of economic and media interests. It reminded me of the time in Italian politics when the priority was to keep the Communists out of government.” The Socialist Party has forged highly symbiotic partnerships with the country’s corporate elite, whose high-paying boardrooms have welcomed many former party officials. For the past two years, top-trading companies that comprise the benchmark index of the Madrid stock exchange—the IBEX 35—have made it crystal clear to the Socialist Party that they should use everything but the kitchen sink to prevent Podemos from entering the government. As for Podemos, congenital tensions have reared their head again. These are often described as a tug-of-war between the party’s “horizontal” and “vertical” chromosomes: the assembly-based “circles” and a leadership willing to sacrifice some internal democracy for the sake of expediency. “We have tried to run and tie our shoelaces at the same time,” the party’s newly appointed secretary of political organization, Pablo Echenique, recently told the independent paper La Marea. (Echenique’s predecessor, Sergio Pascual, left the position in March over an internal row that showcased a growing division between Iglesias and the party’s second-in-command, Íñigo Errejón.) Echenique, also the leader of Podemos in Aragon, where he serves in the regional parliament, has pledged to decentralize the party and breathe new life into the party’s grassroots movement. But despite his and others’ efforts, the party quilt is continually being torn at the seams and stitched back together. Podemos brings together many different political cultures that often clash with one another. Its militants include anarchists, communists, Trotskyists, environmentalists, feminists, animal-rights activists, social democrats, Catalan, Basque, and Galician nationalists—and myriad combinations of these and other political orientations. Moreover, the powerful citizen platforms that Podemos joined or created for local and municipal elections last year increasingly insist on their autonomy, as national and local strategies don’t always line up. The city governments with Podemos participation—including Barcelona, Madrid, and Zaragoza—have celebrated successes but have also run into tough local realities and made rookie mistakes. But these practical considerations may be less important in the long run than the tactical questions that divide the core leadership. Pablo Iglesias, it appears, no longer sees eye to eye with Íñigo Errejón, his old friend and lieutenant. Since the foundation of Podemos, Errejón, a follower of Ernesto Laclau, has insisted on the need for “transversality”: a broad electoral appeal that goes beyond the traditional division between left and right. Concretely, this has meant resisting being boxed into a nationwide coalition with the smaller, and more traditional, United Left. But in practice the media, public opinion, and, in fact, its own constituency identify Podemos as undeniably leftist, ultimately making Errejón’s position seem either self-defeating or opportunist. Since the December elections, pressure mounted for Podemos to form a broad leftist front with the United Left, which, despite receiving nearly a million votes, only managed to elect two delegates. (Other parties won one delegate per 60,000 votes.) This discrepancy is thanks to Spain’s disproportionate electoral system, which benefits coalitions. Had they reached an agreement in the fall, a broad, left front with Podemos would have turned the United Left’s meager two seats into thirteen. On the ballot, however, not much will have changed since December. “It’s curious that we’re going to another round of elections but with the same party leaders,” says Galaup, the journalist. On June 26, voters will “have to decide whether to vote for the same people they voted for or entertain the idea of voting for someone else to see if things change,” she says. Some analysts predict a lower turnout, which would benefit the PP. On the other hand, the newly minted partnership between Podemos and the United Left may re-energize the electorate, and even leapfrog the PSOE, in what people in Spain today have dubbed the sorpasso (Italian for “overtaking”). This will certainly tilt the seat count toward the left. But whether a weakened PSOE would be more willing to support a Podemos-led government is far from clear. It may instead cede to establishment pressure and join a “grand coalition” with the PP, like the ones that rule in Germany and the Netherlands. Meanwhile, Spain’s social and economic reality remains no less dire that it was in December. In early April, the EU noted that Spain had exceeded the norm of its national budget deficit for 2015 and that further draconian cuts were necessary in the current fiscal year. Whatever government finally takes over in Spain will face a hamstrung economy, deep social discontent with politicians, and an unfavorable deck at the table of the EU. And its success will likely hinge more on principled commitments than on temporary deals.